The long-awaited final chapter in Anderson's trilogy about Vietnam veteran Hanson. After several years teaching English literature in Idaho, Hanson has returned to police work as a beat cop in the economically devastated neighborhoods of East Oakland in 1983. Green Sun is a stunning book, and it's more than worth the wait ... Green Sun succeeds on so many levels, it's hard to keep count. As a crime novel, it's paced beautifully; Anderson lets the suspense build naturally, never resorting to cheap narrative tricks at the expense of the plot. His characters are realistic — there are no flawless heroes or evil villains; Anderson has no use for lazy archetypes of any kind. He also displays a canny understanding of psychology ... Hanson is a fascinating and memorable character, but the real star of Green Sun is Anderson's writing. He never succumbs to hard-boiled clichés or tough-guy posturing; he's a compassionate writer who never wastes a single word. 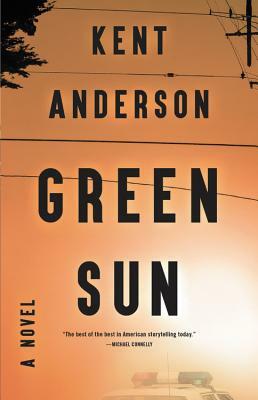 Anderson’s writing is reminiscent of that of James Lee Burke, blending pathos, violence, and corruption with long-shot hope and glimpses of natural wonder ... Green Sun builds to a fraught but satisfying finale, one that likely marks the final literary chapter for Hanson ... Green Sun avoids over-the-top action but maintains narrative tension. Indeed, Anderson’s lean but limber style makes this novel a suitable companion for just about anyone. Green Sun is eminently readable. Anderson has a clear, direct style for the most part, but writes with a poetic flourish when appropriate. Hanson’s recollections, or perhaps dreams or flashbacks, of his time in Vietnam have an otherworldly, and often quite beautiful, feel to them ... Both Night Dogs and Green Sun might make you question why anyone would choose such a dangerous profession, but the author draws a distinction between the department itself and the individuals working in it. Green Sun is a brilliant novel in its own right, and a worthy follow up to Night Dogs. Read them both. What did you think of Green Sun?